If you tuned in for the Super Bowl this year, you’ll remember a commercial for the WeatherTech CupFone holder, a mobile phone mount that can be placed in any vehicle’s cup-holder. 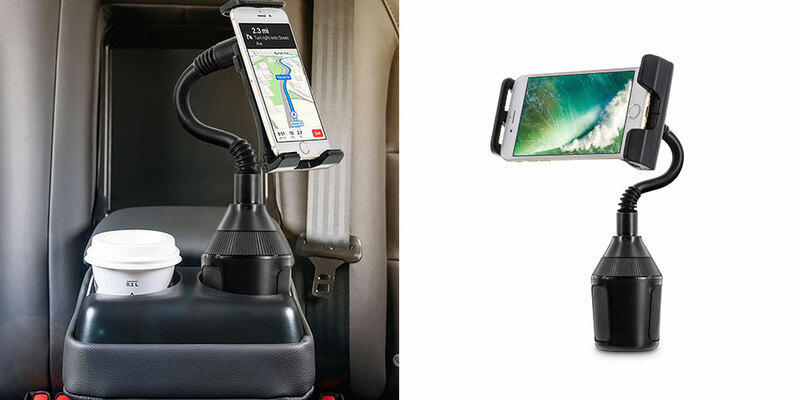 What you may not realize is that this device is more expensive and less versatile than the U-Grip Cup Holder Car Mount for Phones and Tablets. If you’re looking for the perfect car mount for your smartphone, make sure you get the best bang for your buck! The cup holder is actually an ingenious place to mount your navigation device. When you mount a phone on the dashboard or windshield, you’re effectively blocking part of your field of vision. Mounting your phone or tablet on an air vent means that you’ll be blocking air flow. The U-Grip Cup Holder Car Mount keeps your device at the perfect eye level without disrupting your driving. Designed with a flexible neck and rotation capabilities up to 360 degrees, the U-Grip Cup Holder Car Mount is optimized to maximize your comfort and prevent neck strain. The adjustable base ensures you’ll be able to fit into most standard and large cup holders. At 78% off, the U-Grip Cup Holder Car Mount for Phones and Tablets is yours for just $12.99!